Right now, I am writing from Las Vegas, and waiting for CES 2010 to officially begin. I’ll be attending CES Unveiled later this afternoon, where I will get a lot of “sneak peaks” at new products. In the meantime, there have been a lot of new products that have been getting leaked to the media. For example, the IceTouch (YP-H1) from Samsung. This is a new PMP with “the world’s first 2-inch, full-color, transparent Active Matrix Organic Light Emitting Diode (AMOLED) touch-screen display”. Yes, someone finally made a PMP with a completely transparent screen, and that someone was Samsung. Be sure that the history books are updated. The IceTouch can function as “a DVD-quality video player, studio quality audio player, an ultra-portable photo album, and FM radio and even a portable storage device”. It supports such audio formats as MP3, WMA, OGG, FLAC, AAC, M4A, MP3HD codecs, as well as video playback for MPEG4, WMV, H.264, Xvid and Divx file formats. The IceTouch has 16GB worth of memory, and the user interacts with it using a “TouchWiz Sweep” Interface. I’m not certain what that is, but it is “designed to provide a comfortable grip and give users new options for interacting with their player”. 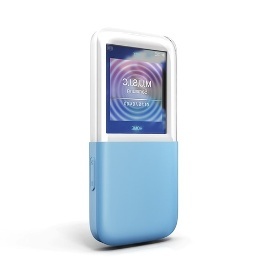 The IceTouch comes in white with customizable skins of pink, blue, purple, and grey. It will be on display at Samsung’s booth at CES, but there is no word on a price or date of availability. I also attended ces for two days. In particular, IceTouch with a transparent color LCD was really interesting! Unfortunately, I could not try out that… I guess that is not fully ready yet.